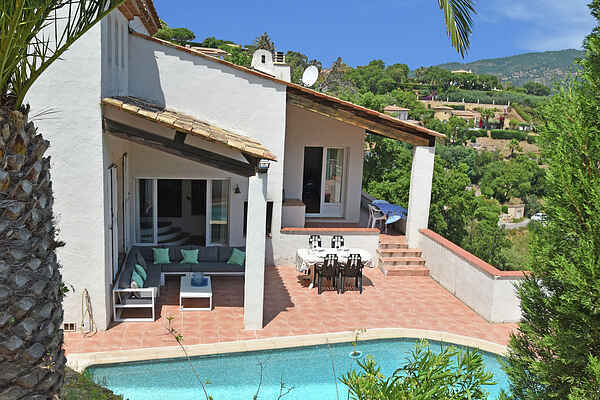 Particularly pleasant location for this comfortable villa; near the golf course and the sandy beaches in an upscale area near the centre of Sainte-Maxime. In Sainte-Maxime you can find a variety of shops, nice bars and good restaurants and for the youth, there is a large water park. During your stay you can enjoy all that this southern French seaside resort and the surrounding area have to offer. If you want to go Saint-Tropez, you can leave the car. From the port there is a frequent ferry service; within about 20 minutes you are already among the luxury yachts in the harbor of this fashionable resort or you are on a terrace with a nice glass of wine. From the terrace of this beautiful villa you have a view of the bay of Saint-Tropez. A living panorama, which throughout the day and evening a feast to watch. The gracefully shaped swimming pool is surrounded by a large sun terrace that turns into two covered terraces adjacent to the villa. One terrace with a lovely lounge set and one terrace with a dining table from where you step right into the kitchen. Inside is a spacious lounge with open fireplace and satellite TV. The kitchen is modern and fully equipped. There are three bedrooms and two bathrooms. This villa is highly recommended!